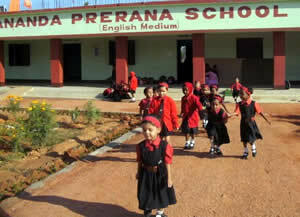 The Ananda Prerana School, located in Jarsuguda, is a Kindergarten in a newly constructed building with 60 children. 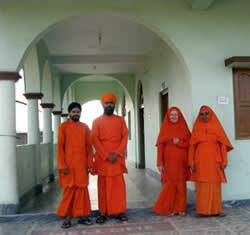 Didi Ananda Pramita is the principal and Didi Ananda Kaoshikii the supervisor. The school has plans for expansion and of becoming a model Neohumanist school. Before the conference we held a pre-conference activity at the school where much work was done on upgrading the environment and the curriculum. 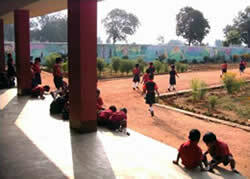 The school has nice vegetables and flower gardens and a big playground. We painted a big mural at the entrance gate with images of children going to school, watering plants, caring for animals, reading, dancing, riding an elephant and doing yoga and meditation. Inside the compound a long wall got the whole Yama and Niyama story, The Fairy Flower, painted on it. 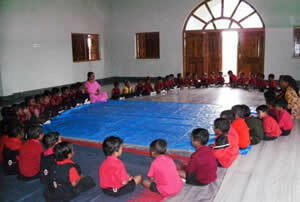 We shifted the Morning Circle into the Dharma Cakra hall where all the children can sit in a circle. The room is called the ‘Circle of Love room’ and it now has a big mural of the Brahmacakra cycle on it. The children enjoyed the colourful additions to the school and even the gardener thought that the new murals went so well with the blooming flowers in the gardens which he tended. I brought lots of puzzles, games, and books for them, including a magnet board with magnet attached letters, bead stringing, memory games, construction games, flannel board, etc.. We set up learning areas for different activities with tables and chairs, shelves, baskets and mats. The block area is demarcated with chalk on the floor, and there is a reading corner, a creativity room, etc. 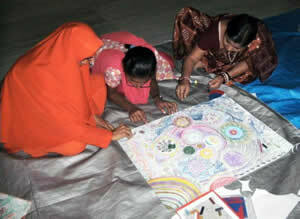 The conference was held on the spacious Master Unit, Ananda Samvrddhi, where a Kindergarten is run with currently 90 children. Dada Hiteshananda Avadhuta is the principal and plans to expand the school in the near future to Primary and Secondary Schools. 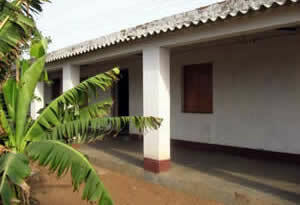 The School has 3 classrooms, Nursery to KG2. They have a big bus to pick up the kids. – ‘Sa vidya’ ya’ vimuktaye’ – ‘Education is that which liberates’ to be posted on a public wall near the office. – A bulletin board for informing parents and visitors about the school, the school calendar, events and announcements. – Posting the E.D.U.C.A.T.I.O.N anagram with title “Objectives of NHE”. These are the traits in the child the school is aiming at through its teachings. – A mural painting of Brahmacakra painted on a big wall. 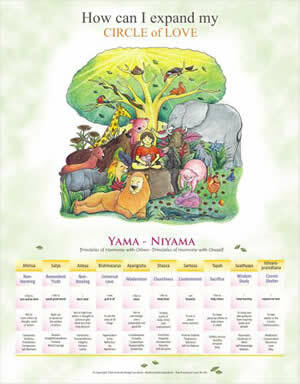 – A Yama and Niyama poster for each classroom. – Vegetable and flower gardens to tend and if possible animals to care for. – English songs with movement from the Circle of Love manual which has over 300 songs, Prabhat Samgiita singing or with mudras, recital of inspiring quotes and Sanskrit verses, sitting meditation, story-telling and yoga for children. – A suggestion was made to hold smaller Morning Circles in individual classrooms where the content could be more age-appropriate. We found a way to introduce new educational material such as puzzles, manipulative educational material, reading books, building blocks and other activities. 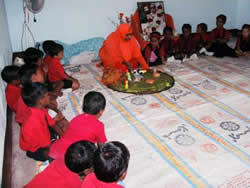 At the Ananda Prerana School one room was set up as the Creativity Room where the new STUVOL syllabus will be implemented. Learning corners with tables and chairs, shelves and mats were set up. Children were instructed about the rules of how to work with the educational material on a one to one basis, and how to return the material after use. This learning method has enriched the child’s experience as the child faced new challenges and was able to measure their own achievement. 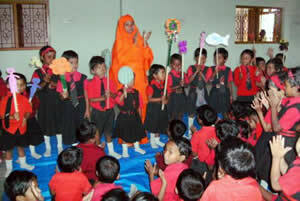 The children also learn to rely on their own timing, making their own choices and practicing responsibility. – All material covered at the conference will be presented by participants at the upcoming Education Training Camp in Raipur.